May Probyn was born in Wales or in France. Her parents were British and she had three younger siblings after the family returned to England. She was educated in Brussels. Her work wasn't popular and therefore little is known about her. In 1878 she published "Once! Twice! Thrice! and Away! A Novel.". In 1881 the "Westminster Review" reviewed her "Poems" (1881) and wrote 'Who May Probyn may be we know not'. Her poems show a witty social criticism and is different from the often sentimental poetry that other female poets from the Victorian era wrote. Her poem "Is it nothing to you" was included in the "Oxford Book of English Verse" (1939 edition). May Probyn was a friend of W.B. Yeats. She died in 1909 was buried at the Roman Catholic Cemetery in Mortlake, London. The inscription on her grave reads: 'That, being dead to this world, she may live to thee'. 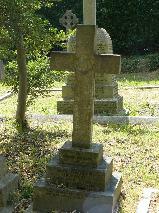 The grave of May Probyn at Mortlake Roman Catholic Cemetery, London.